What would be a port of entry in the United States? If the port of entry is Detroit, then their layover is of 1 hour 47 minutes. Since at port of entry, the immigration and customs check would happen, so is that time sufficient to get these things done and board next flight? Also, in this case, would I have to take check in bags from the 1st airline and then again checked them in flight from Detroit to Houston? Will the flight from Detroit to Houston also have international baggage policy? or would it have domestic baggage policy? This itinerary is of 1 airline only(i.e. KLM) and please find it attached. I wanted to verify these things before finalising the booking. If, on average, each is just above 12 minutes you are already late. And the only one I would guess is below 12 minutes is 4. but only because 3. will be so long that by the time you are done, your bags will wait for you. Some I can do better than guess, https://apps.tsa.dhs.gov/mytsa/wait_times_detail.aspx reports security wait times at this time of the day to be 11-20 minutes. This is not doable. 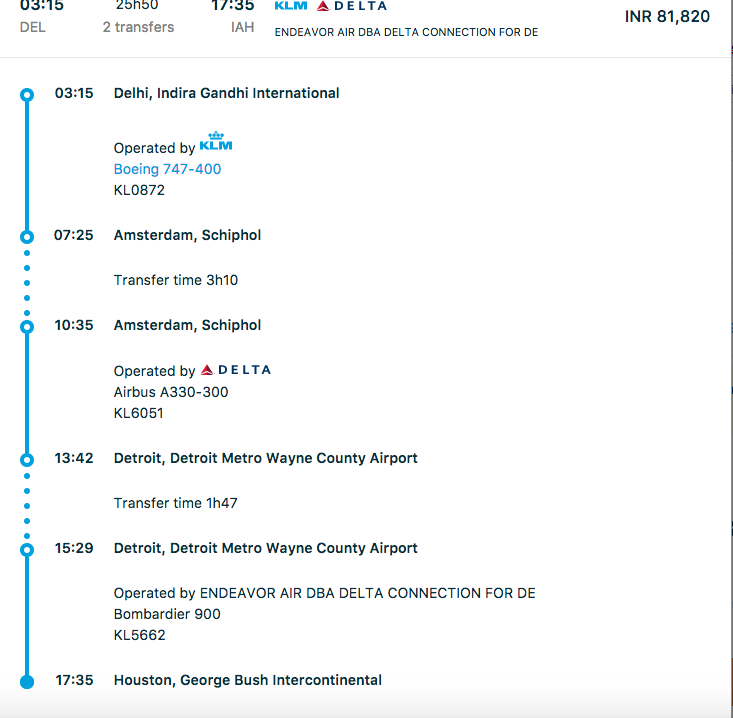 KLM might sell you the ticket and will take care of you (put on a later flight, pay hotel if necessary) -- but expect to miss your flight to Houston. The minimum connection time (MCT) at the Detroit airport for international to domestic connections is 1h30 (source), so with your 1h47 connection you should be fine. Note that for Delta-Delta connections (which is probably the case for you itinerary), the MCT is even lower, 1h20. Note also that immigration, customs, bag re-check, security, etc. are already factored into this minimum connection time. Your port of entry is Detroit. Yes, this is sufficient time (see above). Yes, you have to pick up your bags, go through customs with them, and re-check them. There will be a special baggage re-check just after customs, so this is fast. Your baggage allowance should stay the same from the international flight (baggage policy is per-ticket, not per-flight). Not the answer you're looking for? Browse other questions tagged usa customs-and-immigration india klm or ask your own question.